The era's most trusted and genius surgeon, Black Jack! The dream of what kind of doctor Tezuka Osamu, legendary manga artist and also a licensed doctor, wanted to be... Black Jack! Black Jack consists of a rogue doctor, aliased Black Jack, who for private and safety reasons [since the time of losing his license to practice medicine] must practice medicine in the shadows. He lost his medical license when performing a surgery on a dying patient, which was against the head doctor's orders, thus having his license revoked. Since then, he had turned into a lone connoisseur of the medical field -- mainly surgery. That's right, most of the cases delivered to him require "cutting open" his patients and removing the cancerous, life-threatening, disgusting or simply something that you just wouldn't want in your own body. Throughout Black Jack, heavily moral led themes are present, which runs fairly close to how a real-life situation would be. So it's not all hack and slash or action like many other animes but don't be waned! Black Jack is also a fighter, when needed that is but only to save a life of someone in danger or someone who might be seen to be heavily ill. He may not be your average hero with super powers or control a large mecha that could save the entire world, no. But the reality of what it means to be a hero from a rogue doctor's point-of-view and also realizing that even from mastering your skills, not every life can be saved... Black Jack delivers and keeps on delivering. With a stitched up face and a generally hideous yet handsome look, Black Jack is a lone hero that you do not want to miss out on. Tezuka Osamu's greatest work, Black Jack! Let me just start off by saying that I really love Black Jack. 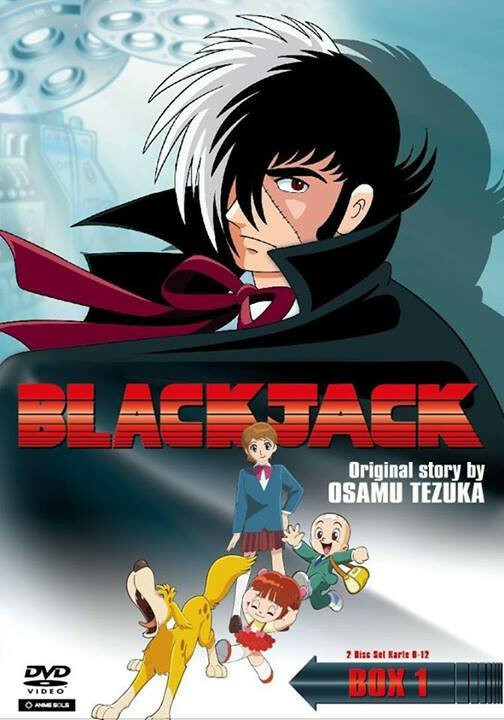 When I was younger, I watched and loved Black Jack 21. Later, I got into reading the original manga by Mister Tezuka. When I saw this series released on crunchyroll, I just about peed my pants with excitement! This anime, in effect, is almost the manga word for word. Some characters and short stories have been added, as well as a few aspects changed to adapt it to this era. However, it still feels exactly like they animated the manga into life. The changes are too small and undramatic to really be noticed. However, while some people really enjoy seeing their favorite manga animated, I feel that it's somewhat repetitive. There wasn't enough new content in the anime that wasn't in the manga to keep me coming back to watch new episodes. I believe, if you're new to Black Jack or have only seen or read a few things with or about him, this would be an amazingly good series to start with! However, if you're an old expert looking for something new, this series isn't really going to blow your mind. I Find it Hard to Get Into This One..
First of all, I will comment and state that I watched the first 12 episodes and the 4 specials that came before it. I have read parts of the original comic and I have seen the older television shows. I did not find this to be nearly as enjoyable as I was anticipating. While the opening credit's music is soaring and I really enjoyed it, this series so far is a giant let down. True, it keeps to the comic fairly reasonably (although there appears to be a lot less death in this series than there was in the manga), but the show is redundant. Not just that, but I find Pinoko's character (the sidekick if you will) to be utterly annoying. Every episode, she can be heard saying the same 'Pinoko-ism' that no one really understands, with the same dumb expression. Her voice is grating and I don't think she provides good comic relief to the main character, Black Jack. This is sad because many of the stories are very heartfelt and you can see yourself starting to get involved in them.. and then her character with the atrocious voice comes in and ruins the whole thing. All in all, I just can't give this a good recommendation as far as shows I consider worth watching. And especially as a fan of the older shows, I can't recommend this remake to anyone. I will start by saying that I am a huge fan of Osamu Tezuka and the characters he created, like Unico and Kimba the White Lion. I discovered Black Jack a few years ago... and I was instantly hooked! This TV series is wonderful, and stays very true to the original manga. There are a few changes here and there, especially in the sequel series Black Jack 21, but all of it works perfectly. One of the big changes is the surgery scenes are not really shown in such detail as in the manga or the OVAs or movies, but rather, Black Jack's scalpel glides across the screen with the emphasis upon the genius surgeon performing medical miracles. Many of the stories also connect to one another, while they were mainly stand alone stories in the manga, and many characters from Tezuka's Star System (he used characters in different roles, like actors in a theater group performing different parts) are given more than just a one-shot role. Before this review gets WAY too long, I urge anyone who is a fan of medical drama, Osamu Tezuka or old skool anime to give this series a try. Osamu Tezuka is considered the God of Manga, and this is one of his magnificent creations at work! In my opinion the show was a great mix that you can sit down and enjoy with someone younger, as well as someone older. Really great but not perfect, the character Black Jack easily falls in my top 10 badass protagonists, but the character of Pinoko sets off the sense of drama you get from cases. Some people may like that but I find it a bit too over the top. I would also totally recommend young Black Jack currently on simulcast as it is pretty much Black Jack done for a more mature audience. I would seriously recommend to anyone who has the time, and even if they don't all the episodes are really heartwarming and help me get back on my feet with a new outlook on life after every episode, so I don't think they would be wasting any time. Actual rating 4.5 because crunchyroll doesn't like decimals. I was treated one day to a VHS tape that my mother had found on a market stall, and it was a few episodes of Black Jack. Not in order, I might add - but they were there in all their glory. Black Jack is the story of a gifted, genius surgeon (or Doctor if you prefer) who was struck off the medical register for reasons you'll come to learn throughout this wonderful series as he goes on to save countless people, animals and even inanimate objects. Watch it, love it, cherish it in your hearts. I recently bought the entirety of Black Jack on DVD purely so I can always watch it, always cherish it, and always remember it. I absolutely love the concept of Black Jack and the series as a whole, but it gets cheesy and childish in some parts then again I'm guessing this was originally for children. The series revolves around a unlicensed doctor that can perform miraculous medical procedures and also charges exorbitant fees unless you can sway his heart. Its an enjoyable series when medical emergencies and the action scenes. I also love how Tezuka draws animals, so cute! We need more Black Jack! Black jack was pretty good, but most of the time it just went episode by episode, meaning very little character development. The stories showcase his skills aswell as his good personality as he visits different places. He does have a traumatic past, though. Which i love. I recommend this show for anyone who has spare time, and wants to keep bsy with a short but good show.